Valspar’s products are lesser-known, but provide fair value for the money. If coverage were better, we’d give 5 stars. This paint goes on easily and dries quickly. Within 72 hours, you’ll be parking cars on top of it. As the manufacturer explains, the finished surface is resistant to marks and wearing, under reasonable use. Though the manufacturer say that a single-car garage should be covered, some users have found this not to be the case. If you’re looking to give a concrete floor a more attractive or professional finish, then a garage floor coating could be exactly what you need. 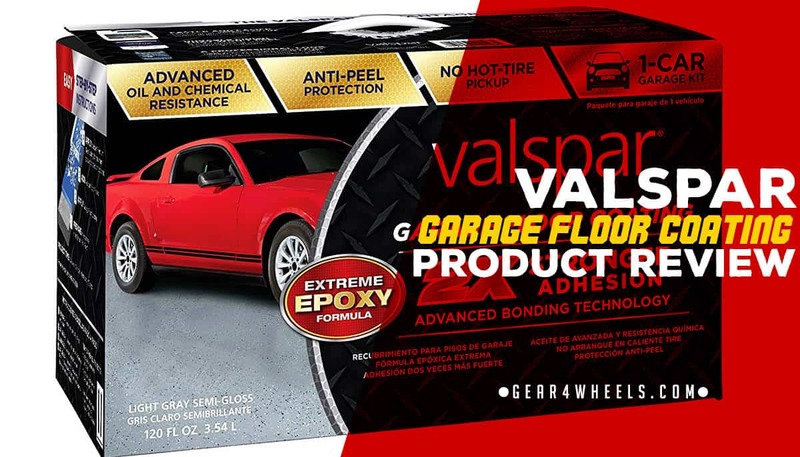 Contrary to belief, they do not necessarily lead to a more easily damaged surface; this Garage Floor Coating from Valspar is cheap and easy to use, while being twice as durable as concrete flooring. This Valspar Garage Floor Coating has been around since at least 2004, enjoying mostly positive customer feedback to this day. This coating, which comes in two distinct colors, allows you to paint a concrete surface, such as the floor within your garage or a concrete porch walkway, and the entire process can be carried out at home within a short timeframe. Though Valspar is one of the lesser-known brands in the industry, they provide excellent quality and affordability within their range of paint products. Their epoxies are usually significantly more affordable than the more recognizable brand names, without sacrificing on quality. As far as the industry goes for products like these, this is one the easiest to use epoxies available, designed to be used as a single-coat paint. The box comes with everything you'll need to apply a single coat of paint to your concrete floor. The manufacturer estimates that you should be able to apply this coat to a single-car garage, though some customers have reported getting more use out of the box, even coating 2 garages. However, this product is less suitable for commercial purposes. This is not just due to the range of coverage offered by the kit, but also due to the risk posed by chemical products. Spillages of such products could result in clouding within the paint, so it’s best to avoid using this epoxy in any environment where this poses a risk. Included within the box is everything that you'll need to treat and cover your concrete floor. First, you'll want to use the Valspar Fast Prep All-in-One Concrete Cleaner to clean and degrease your floor, as well as etching the surface. Etching is a process that increases adhesion for the product. After this process, you’ll want to wait 4 to 12 hours for the surface to dry. Next, you're going to want to use the included Hardener with the Valspar Base, allowing the compound to stand for 30 minutes. This will prepare the product for application. Once 30 minutes have elapsed, you can begin to apply the coating to your surface with a roller in long strokes, though a roller is not included. 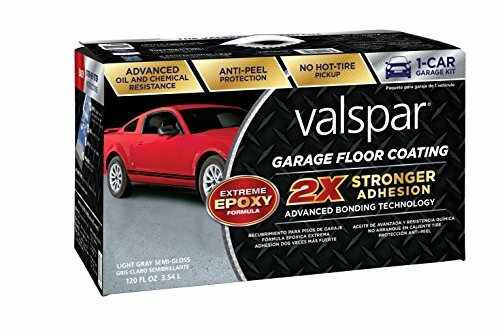 Additionally, the box includes a container of Valspar Color Mix Flakes, which can be used to sprinkle over the Valspar Garage Floor Coating once it has been laid down. If you do opt to use these flakes, which can offer a more professionally flecked finish, then you should ensure an even coating across the whole painted surface. This Velspar product comes in several colors, including 'Tan' and 'Light Gray,' though the manufacturer also offers a clear epoxy that can be used to create glittered surfaces, for example. The resulting coverage produces a high-gloss finish and is ideal for producing a more attractive look on an exterior floor. Though this type of covering is also suited to industrial showroom floors, it is not necessarily suited to commercial purposes. Despite this being a relatively inexpensive epoxy, it is still an extremely durable product. The manufacturer touts the fact that the finished surface is twice as strong as the concrete itself, while resisting the wear of tires, and providing protection against scratching, knocks and scrapes. Velspar explains that the chemical resilience of the product is strong, which is true if you rapidly clean up the spillage, but damage can occur if you’re not quick enough. If you’d like to coat a concrete surface within your home, but don’t want to shell out for one of the more expensive, bigger brand names, then Valspar is a decent alternative. You may not get quite the same level of coverage, but this epoxy is a cheap and incredibly durable product.